I love westerns. True story. I think it started when I was young and my dad’s Louis L’Amour books were stacked around the house. I also love mysteries and thrillers so the combo of a western and mystery = book bliss. A new installment in C.J. 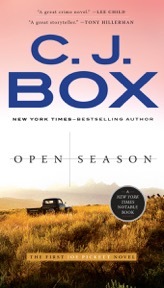 Box’s Joe Pickett series always jumps to the top of my to-be-read list. Today, the #1 NYT bestselling author joins us for a rapid-fire Q&A. Q. What’s your favorite book from childhood? A. Either THE BIG SKY by A.B. Guthrie, CATCH-22 by Joseph Heller, or LITTLE BIG MAN by Thomas Berger. If I could only take five books to a desert island, those would still be three of them. Q. Favorite beverage/snack while you read or write? A. Coffee and water. Boring. Q. What book would you like to be a character in? A. LITTLE BIG MAN, provided I survived. Q. Who is your writing heroine/hero? A. Thomas McGuane is my favorite author and stylist. He’s a magician with words and he gets the modern west like no other. Plus, he’s a fly-fisherman. Q. What’s your favorite genre to read in your free time? 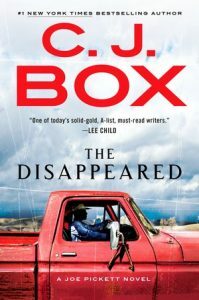 A. I’m asked to blurb a lot of debut mystery/thriller books, so I read a ton of them. But I also like to read widely: history, biographies, literary novels (although many are less-than-advertised) and environmental/outdoor stuff. Q. How do you organize your home library? A. In my office, I have a big supply of my own books as well as reference books. In our home, we have a shelf of our favorites from way back, a shelf of signed books, and a shelf of miscellaneous. We recently moved to a ranch and we couldn’t believe how many books we had. Q. Saddest book you’ve ever read? A. THE WHITE DAWN by James Houston. Great book, but a very depressing novel about the inability of cultures to mesh. Q. Name a book you can’t get out of your head? A. There are just too many, but I’m always thinking about CATCH-22. Every time I read it at a different stage of my life I get something new out of it. Q. Where is your favorite place to read? A. We have a kind of “reading area” in our bedroom with a good chair, a nice lamp, and a view of the mountains. Q. Where do you do your writing? A. My office is on the top of our barn, which is about two hundred yards from our house. I trudge through the snow to get there and I’ve got a view of our horses in the corral below. Q. Scariest book you’ve ever read? A. BLOOD MERIDIAN by Cormac McCarthy. Yikes. Q. What book do you reread over and over? Q. If you could meet one writer ~ living or deceased ~ who would it be? A. Mark Twain, hands down. Q. What book is on your bedside table right now? A. Two of them: THE BORDER by Don Winslow and CATTLE KINGDOM by Christopher Knowlton. Q. What do you have coming next for readers? 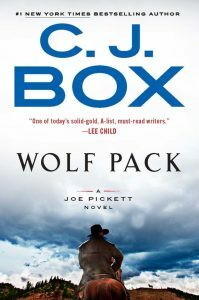 A. WOLF PACK, the new Joe Pickett, is out now. THE BITTERROOTS with Cassie Dewell is scheduled for August of 2019.